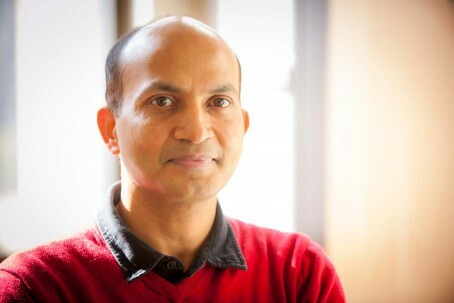 Venugopal Mendu set out to do something useful for the world. 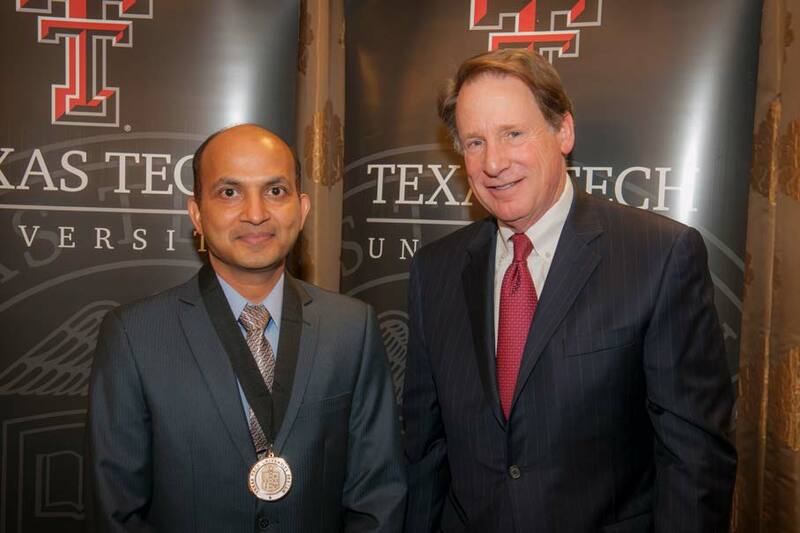 His fascination with plants earned him the Texas Tech University System's highest research honor. Six years ago, Venugopal Mendu was westward-bound, preparing to interview for a faculty and research scientist position at Texas Tech University. On paper, the job suited his interests in cell wall biology and biochemistry. As his plane descended over Lubbock, he looked out the window — and knew he’d made the right choice. “When I saw all those cotton fields around the airport, I figured, ‘This is the perfect place for me,’” Mendu said. He took the job with the Texas Tech, made his home on the South Plains and became an assistant professor of plant and soil science. Fittingly, his research focused on cotton fiber. “Considering that 40 percent of the cotton grown in the United States is produced in this area and that about 96 percent of cotton fiber is cellulose, which has so many practical uses in the world, what could be a better environment for teaching and research than right here in Lubbock?” he said. Mendu continued researching ways to improve cotton fiber, earning acclaim for identifying and characterizing the genes involved in plant cell wall biosynthesis. 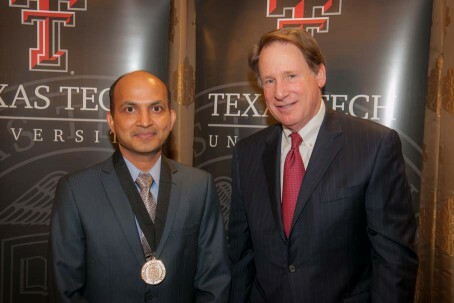 Former Texas Tech University System Chancellor Robert Duncan, right, and Venugopal Mendu during a campus ceremony recognizing Texas Tech University recipients on Jan. 25, 2018. 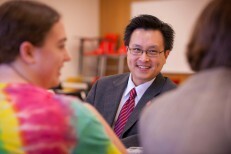 In honor of his career of achievement, he was awarded the Chancellor’s Council Distinguished Research Award, the most prestigious honor given to faculty members throughout the Texas Tech University System. Mendu received $5,000 and a medallion for his excellence, funded by annual membership gifts to the Chancellor’s Council — a giving society that supports the chancellor’s priorities by impacting student lives through scholarships, recognizing faculty achievement and encouraging excellence across all four system universities. 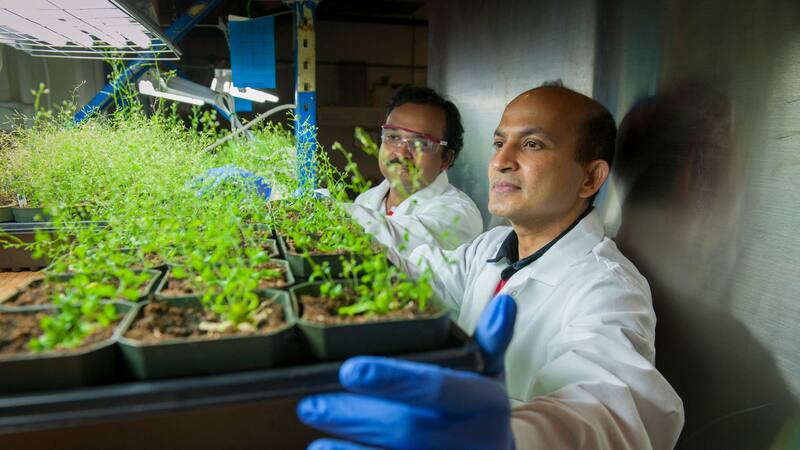 Venugopal Mendu, right, adjusts a tray of plant specimens in his research laboratory. Growing up in India, honors and awards were not on Mendu’s mind. His chief interest was science, primarily plant life. Mendu earned his bachelor’s degree in agriculture and master’s degree in genetics and plant breeding from Acharya N.G. Ranga Agricultural University, India’s largest institution of higher education. Seeking “the most advanced training in cell biology and biochemistry available” he moved to the U.S., where he earned his doctorate in plant physiology, biochemistry and molecular biology from the University of Kentucky. 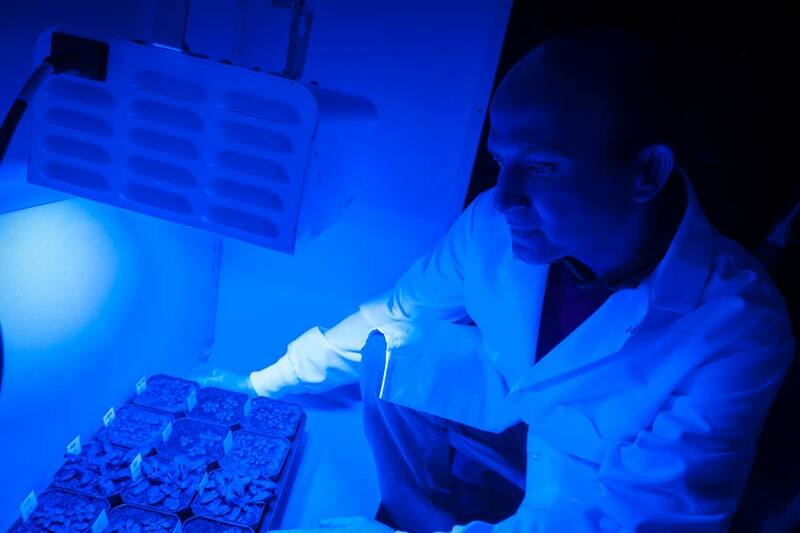 Venugopal Mendu examines a tray of plant specimens growing under a black light in his lab at Texas Tech University. Looking for experience outside the U.S., Mendu travelled to Paris where he served two years as a postdoctoral fellow at the Institute of Biology at the École Normale Supérieure, one of the most selective and prestigious higher education institutions outside of France’s public university system. It was there he heard about the opportunity at Texas Tech. As a professor of molecular biology and a scientist, Mendu is almost always at work, which he doesn’t mind. “All my time is spent either in research, in developing proposals or in preparing for my classes,” he said. “That goes beyond regular hours, because my students email at all hours, and I try to respond as quickly and completely as I can. “And I really enjoy teaching. I invest lot of time preparing for class, organizing slides, trying to bring the latest knowledge to the classroom. [Students are] really taking what I teach and using it to discover more for themselves,” he said. 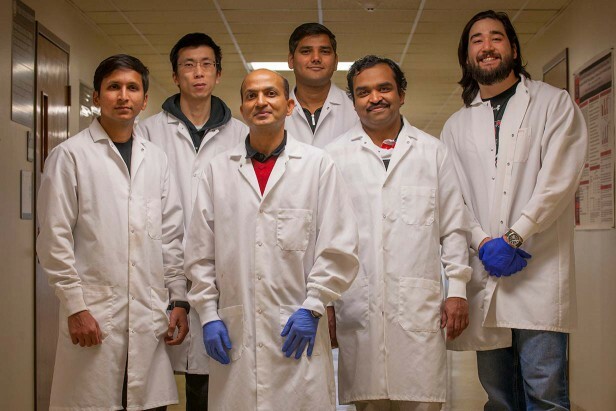 Venugopal Mendu, center, with members of his research team outside his lab at Texas Tech University. 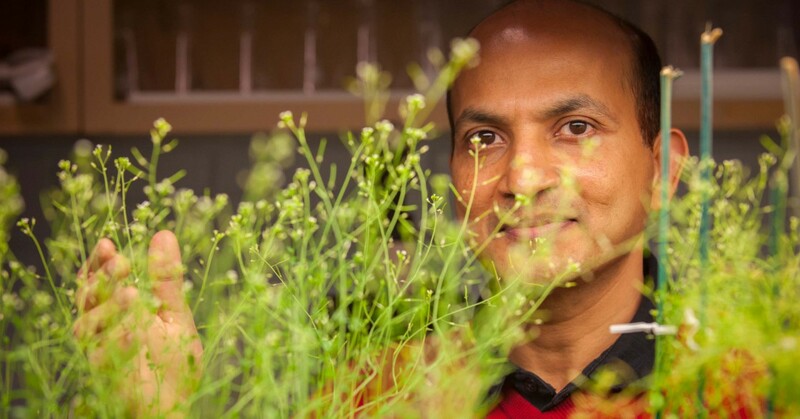 As a researcher, Mendu has contributed to fundamental discoveries, working with colleagues to better understand the properties and capabilities of the cell wall mechanism in model plant Arabidopsis and crops like cotton and sorghum. Plant cell walls are made up of cellulose, the earth’s most abundant organic biopolymer used in numerous consumer products. Because cotton fibers are almost pure cellulose, the commodity crop provides researchers like Mendu a unique opportunity to better understand one of the major building blocks of all plant life. “We have also discovered, from studying species of the Texas wildflower, antimicrobial compounds that can kill harmful bacteria,” he said. While the nature of his research may be daunting to the average non-scientist, Mendu stresses there is much about plant life that’s remarkably easy to understand. Given his involvement and enthusiasm for his work, Mendu admits he has little time for hobbies. “I guess you could say science is my hobby,” he said with a chuckle. “I enjoy reading about different areas of science, to learn more. And I like to travel. I especially enjoy visiting places as part of my research and that’s taken me all over the world, to Africa, Asia, South America, Europe.